You may have heard of Stephen King. I think he sold a book or two… or 350 million. 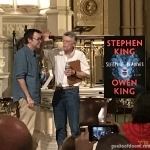 The world-famous author and his son, fellow author Owen King, packed the St. Ann’s & the Holy Trinity Church in Brooklyn, NY on Tuesday, September 26, as part of an event put on by Books Are Magic, a bookstore in Cobble Hill. 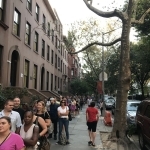 We got there for the 8:00 PM event at 4:30 PM, and the line was already wrapped around the block. I asked the group sitting in folding chairs in the front when they got there and the casually responded, 9:30 AM. 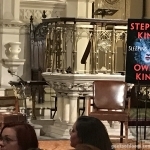 Introduced by Emma Straub, owner of the bookstore and daughter of King collaborator Peter Straub, the Kings took the stage to raucous applause. The two were there to introduce their latest project, the 700-page novel Sleeping Beauties, as well as take part in a self-led Q&A. Sleeping Beauties is King’s 57th novel, but the concept here came from Owen, the youngest of three kids for Stephen and wife Tabitha, also an author. Owen’s first full-length novel, Double Feature, debuted in 2013. Sleeping Beauties, as the title may imply, is about a plague of sleep that befalls the female population. When the applause finally died down, the authors took turns reading sections from the novel. 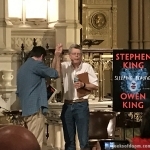 A few quick observations I had were how genuinely happy the audience was to sit on a weeknight in an non-airconditioned church listening to these men read. My father had a giddy look on his face. A constant reader of King since the 1970s, my dad essentially has grown with King over 40+ years. I’m 35, and I’ve known King since single digits, running from Pennywise in 1990, reading Eye of the Dragon and Cycle of the Werewolf when I was barely out of elementary school. Father and son then exchanged questions with each other for about 30+ minutes, discussing the story of Sleeping Beauties, their collaboration process, and Owen’s childhood. 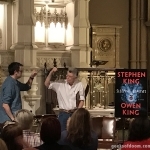 Stephen told stories about framing the female characters in the novel on the strong and hard women he knew his whole life, including sharing some particularly hilarious stories about his grandmother-in-law Hattie. Big cheers came when they revealed that Stephen had put in a call to people at GI Joe to make a specific figure Owen came up with. 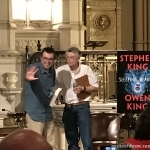 Fan: You’re Stephen King, right? Fan: You wrote The Stand, excellent dude! You wrote The Shining, I love that book, it scared the heck out of me… so you writing anything new? 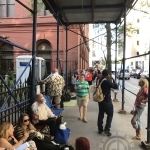 Everyone who arrived early enough received copies of the book, several hundred were signed copies. All in all, this was a bucket list checkmark. There are few people in the world of entertainment who have played a larger role in shaping the last 40+ years than Stephen King. Best of all, he felt like the most down to Earth person you could possibly meet. This year alone has seen a new version of It hit the big screen and shatter box office records and Gerald’s Game just arrived on Netflix to critical acclaim. The hour flew by, and you forget you were surrounded by strangers, instead feeling very direct and intimate. 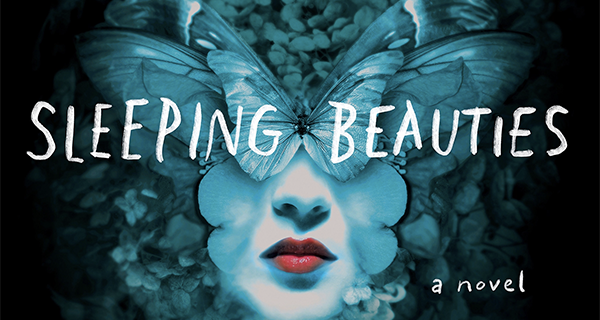 Sleeping Beauties is out in stores now. Books Are Magic is located at 225 Smith Street in Cobble Hill, Brooklyn. Check out their website for all future events.